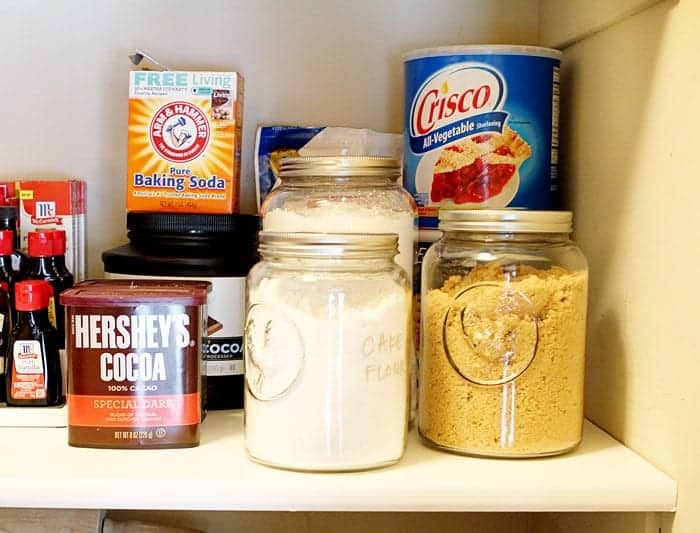 See how my kitchen pantry was transformed after some much-needed organization! 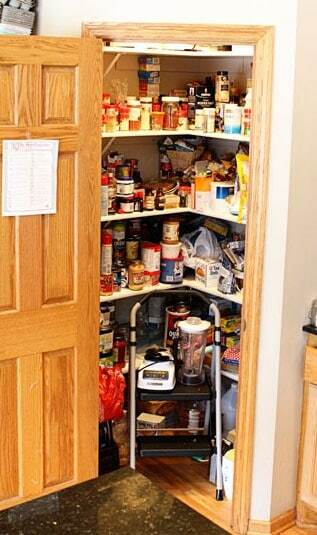 This is my pantry. 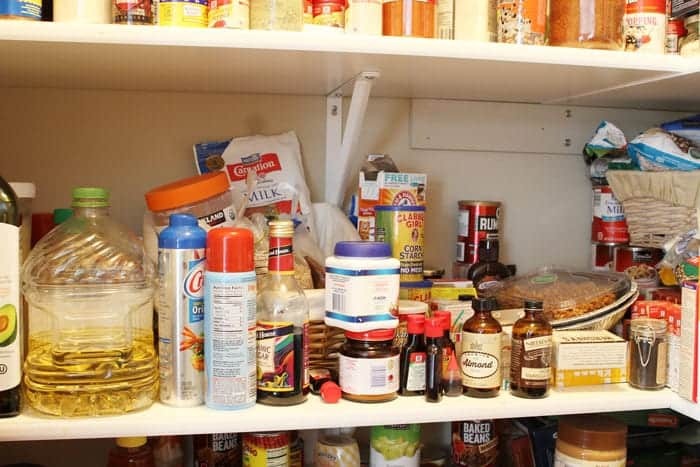 This is my messy, unorganized, over-flowing, ridiculous pantry. The shelves are overflowing. There is no rhyme or reason. Just stuff. On top of stuff. Is there even any food in there? After I started cleaning stuff out of the pantry I realized that I had a big problem. Two shelves covered every available surface in my kitchen. That is stuff from only TWO shelves!! Not only was I grossed out by the mess, but it felt so wasteful. By simply not knowing what I had on those shelves I was buying more and more supplies. A waste of space and money! I realized had SIX containers of Chili Powder. I had 37 bags of half-used chocolate chips. There were 12 boxes of cake mix. 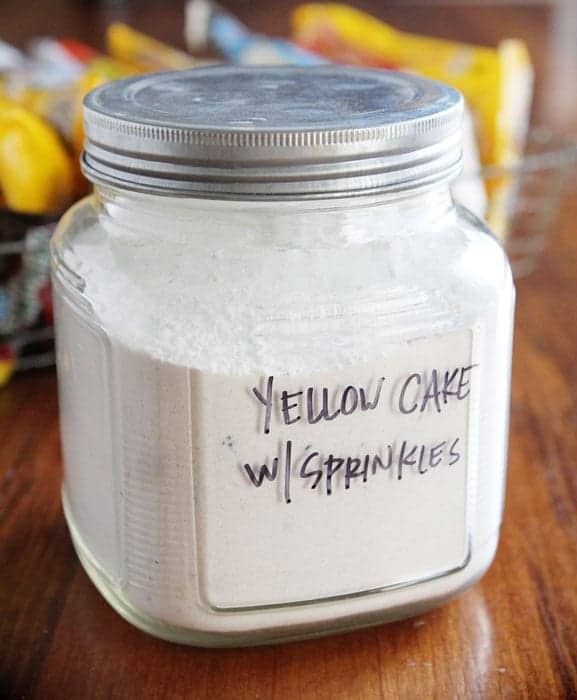 I make my own cake mix! Well. After promising a tour of this space on a Live Facebook Chat I was inspired to clean it. I could not be happier! This space just feels better. 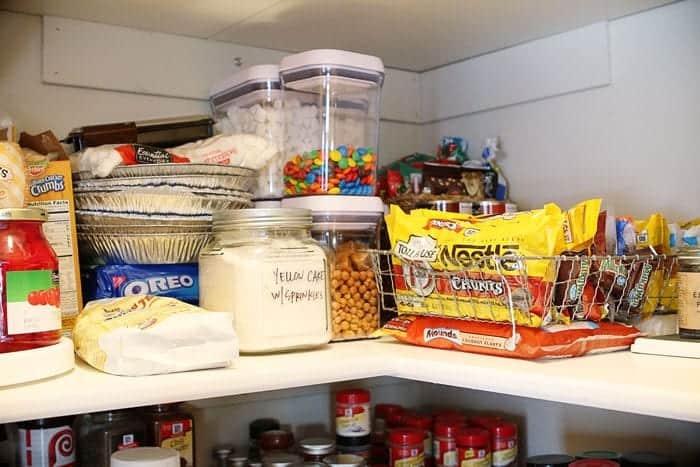 Have you seen The Khloe Kardashian pantry tour? I saw it and immediately went into a #shamespiral. 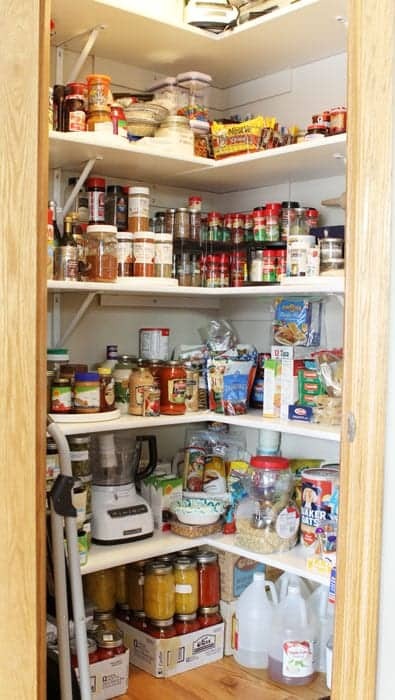 Why didn’t my pantry look like that? 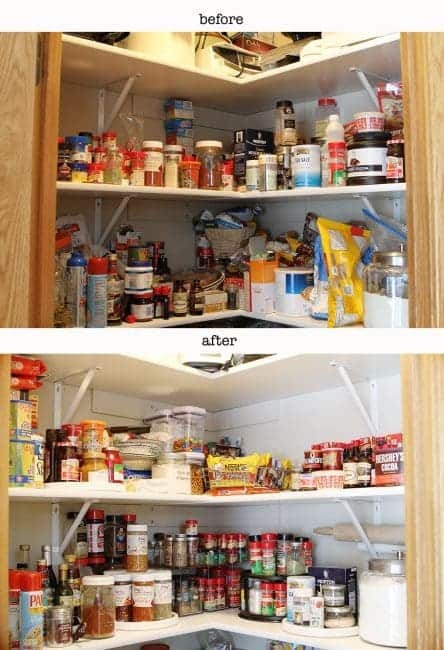 I want my pantry to look like that! 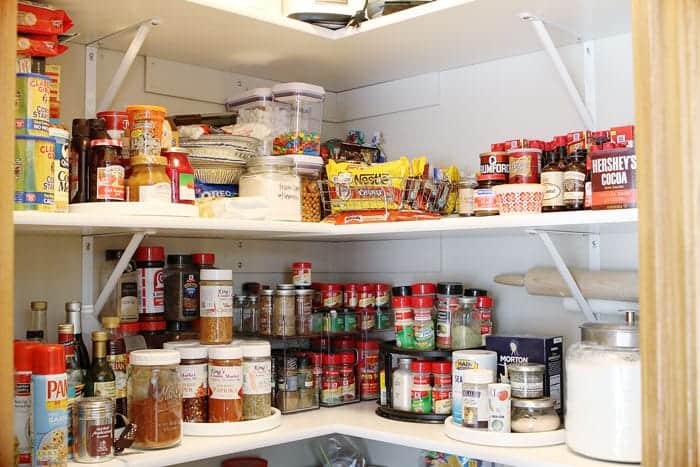 Could my pantry every look like that? The answer is no. For three important reasons. We are a homesteading family. We have canned goods and canning supplies and big clunky tools and appliances and our pantry supply fluctuates with the seasons. Life is simply NOT this perfect. Then end. But I can sure try to make it is organized as possible. I am a big time fan of lazy-susans. 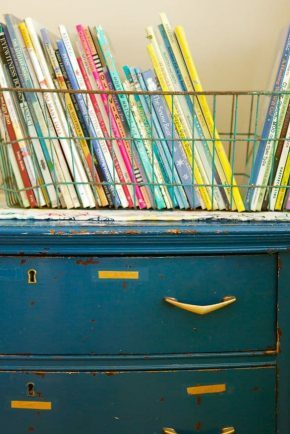 They work perfectly in a pantry (and every room of the house!) and most especially for spices. You can barely see it but to the left, I have a jar of homemade Taco Seasoning. Because we use this at least once a week, it made sense to start making my own. I buy the spices in bulk from the local grocery store. 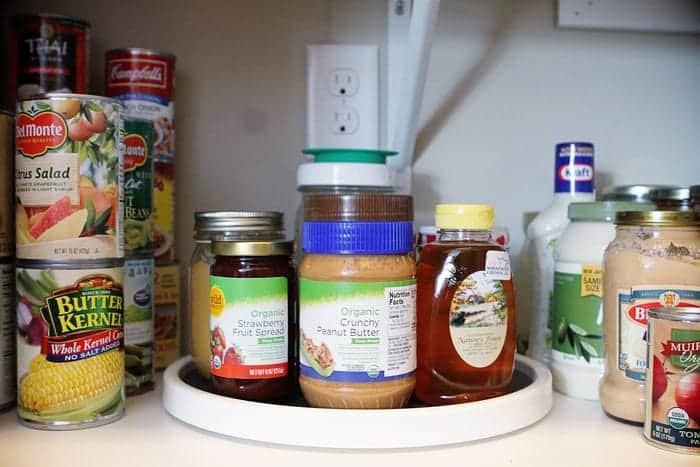 The kids are old enough to be making their own snacks, so I keep those staples on their level and also on a lazy-susan. They love peanut butter and honey sandwiches! After removing everything from two shelves in the pantry, I decided to switch things up and put the spices on a lower shelf. Because we use them with such frequency this really makes more sense! 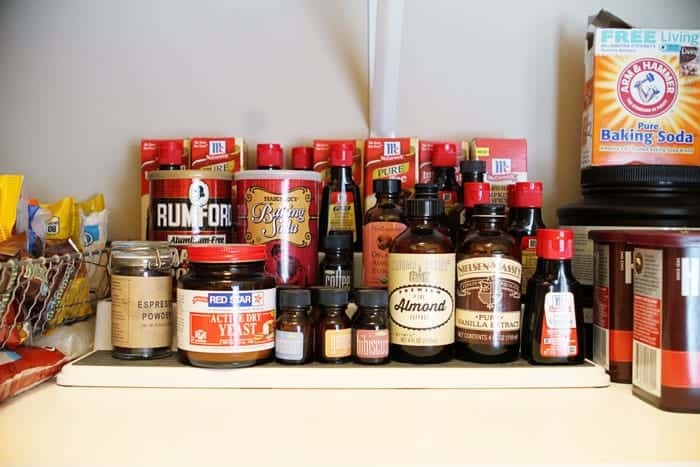 I use a LOT of baking supplies on a daily basis, so this is definitely not the norm in most pantries. You can see above that the flour and sugar are stored in large glass jars. Directly above them is the cake flour, confectioners sugar, brown sugar, cocoa, etc. I found these jars at Homegoods and love the sweet chicken on them. (We raise chickens… we get about 20 eggs a day!) But I also love that I can just write on the jar when I change out the contents. For the chocolate chips, I found this wire basket at a flea market. I keep the chips in their packaging for a very specific reason and that is that they are all measured out for me. One bag is 12 ounces or 2 cups. 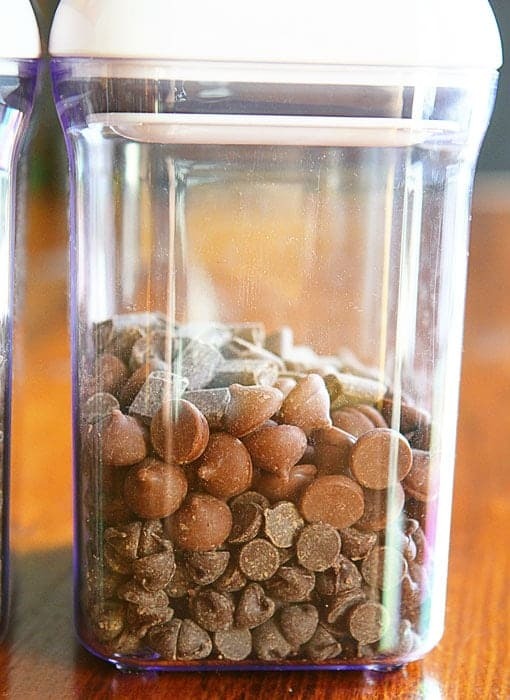 When I get a really large supply of chocolate chips (like the bags at Costco) I will put them in an airtight container. 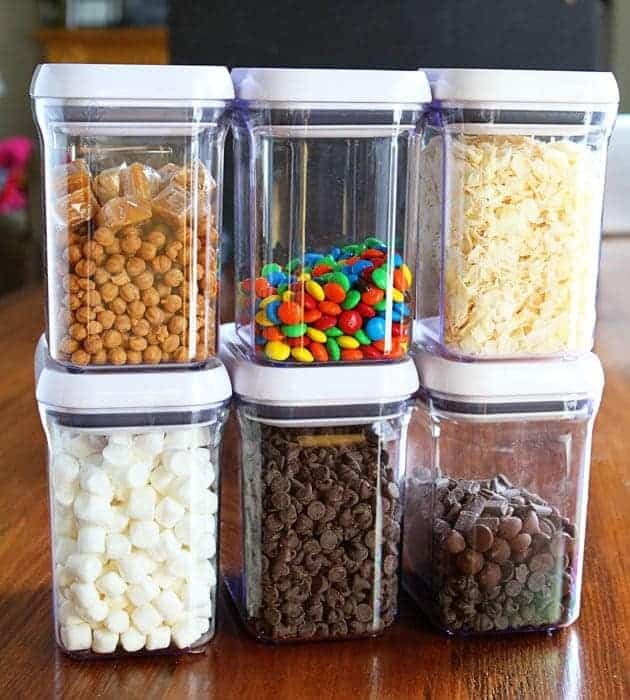 Speaking of air-tight containers, these are one of my favs! They are compact, clear, and easy to use. See that container on the bottom right? I decided to store all my random left-over chocolate chips in it. 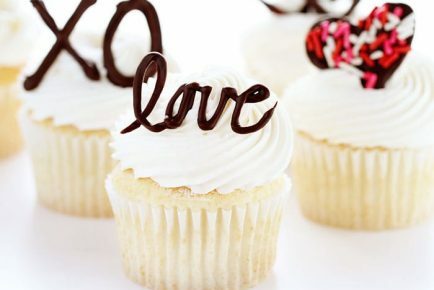 When I am baking for fun it is easy just to grab this and add to cookies or cupcakes. Plus… much cleaner! You know I had to make room for my Homemade Cake Mixes! 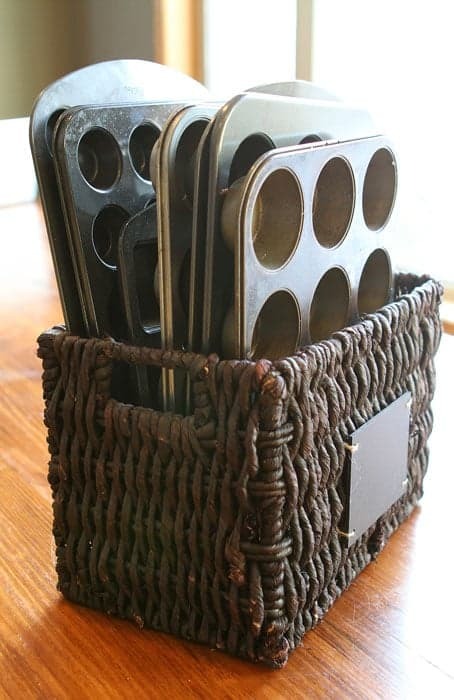 I store my cupcake pans in this magazine basket. It works absolutely perfectly! 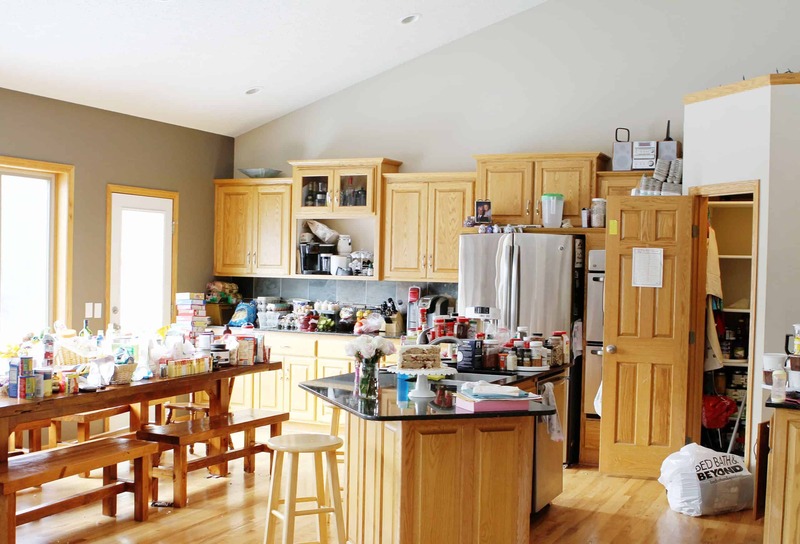 The bottom shelves and floor space is reserved for all the canning, small appliances, and other miscellaneous supplies. Here are a couple side-by-side pictures so you can see just how much was done. 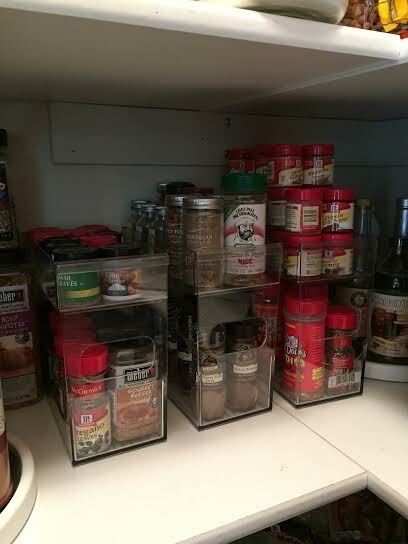 So many people have asked about the spice racks… how do they work, where did I get them, are the actually convenient? Here is a little video showing how easy they are to use. I simply slide it out when I need a spice at the back. Because of the size and shape, you can see the label of every bottle in the rack when you organize it. The pantry is a walk-in and while it is definitely not huge, it fits our needs. 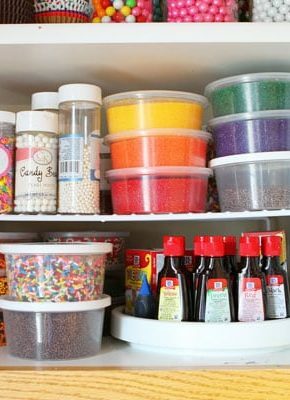 You can check out my Sprinkles Cabinet before&after here! 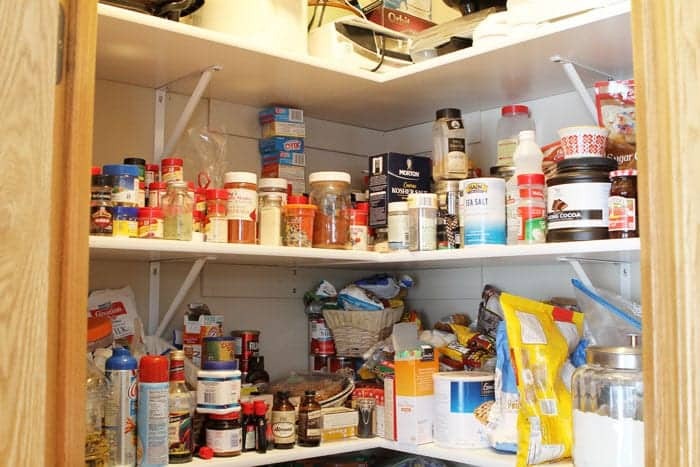 Your pantry is wonderful! 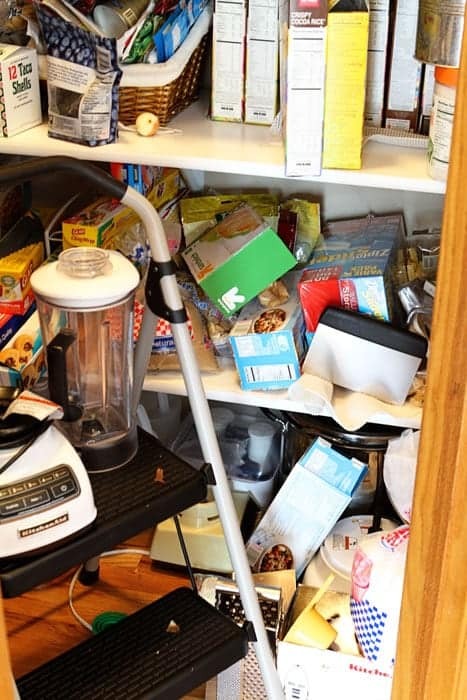 I bet you’ll notice that you’re finishing meals/baking quicker because you can easily find what you’re looking for. I try to keep it organized and put things back as I go, as well as making sure things get put away right the first time after shopping. It takes more time in the beginning, but the upkeep is a lot easier than the loss of time searching for something you know you have (or buying another because you don’t think you do (but actually have 12)), and when you do clean or reorganize, it goes a lot quicker when it’s kept up. Alas, it’s easier said than done. Fantastic job! 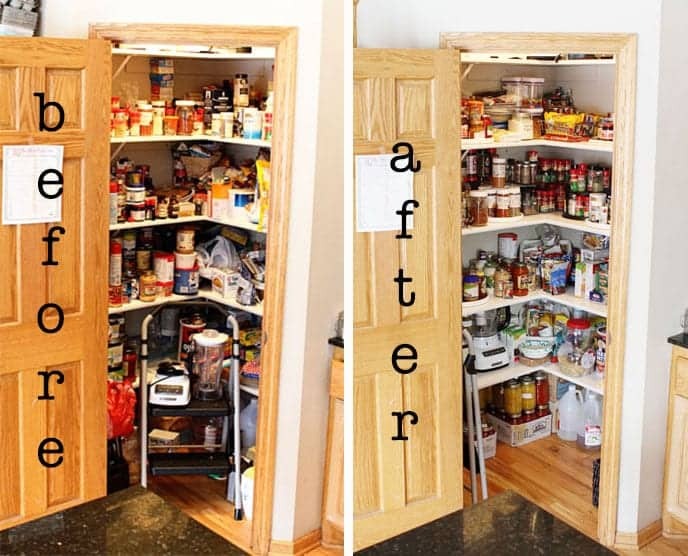 I wish I had your pantry! 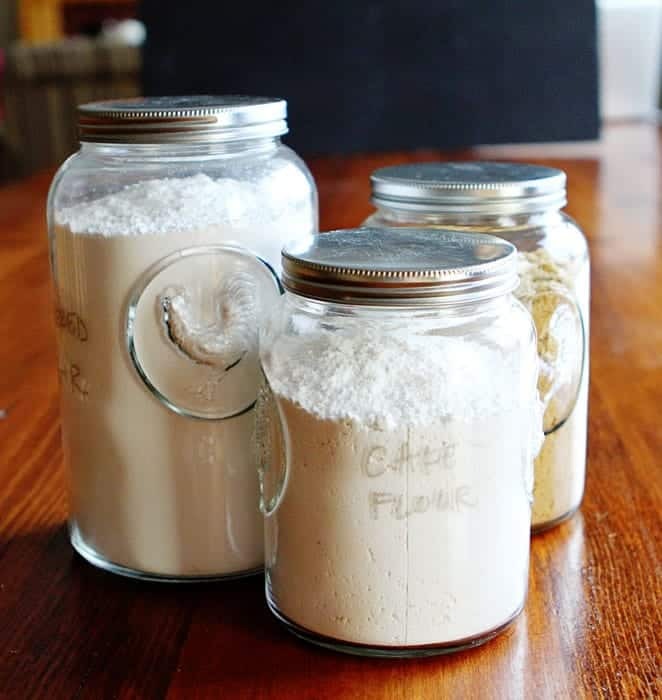 I too keep all my flour, sugar, and large-quantity dry goods in clear jars. 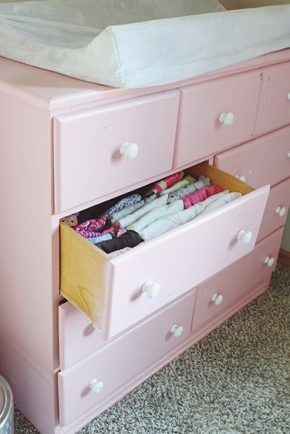 So pretty, and an easy way to keep things air-tight. 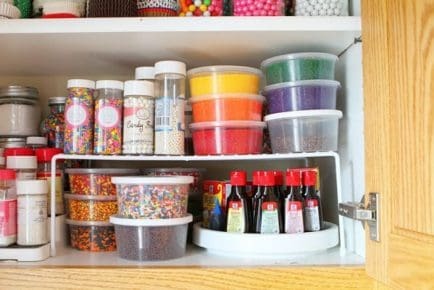 I am not sure if I just missed it, but where did you get the containers for organization? great job! All are from Bed, Bath, & Beyond! Thanks Amanda. I like your shelves and did you know aclar may be I just mistake spelling. It have like pipes cover cream. You can show its for me. Wow, this is amazing! 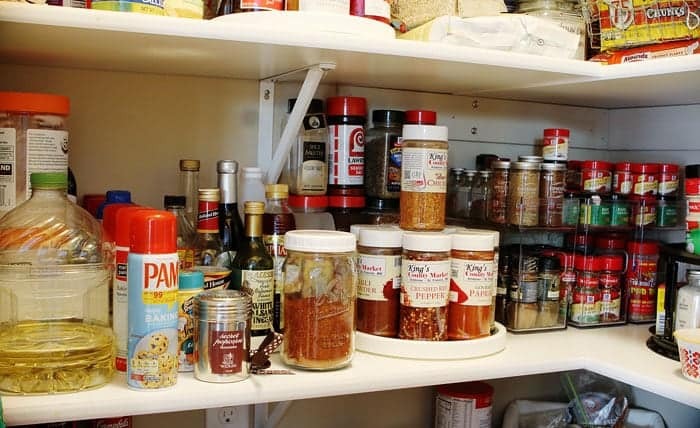 It’s so nice to see an organized pantry, and you gave me some great ideas too. 🙂 Really appreciate this post, thanks! Hi, this is the first time I’ve read your blog and I just wanted to take a second to say that it’s really nobodies business what you have in your pantry and how you shop. I find it incredibly rude that people would even think to comment to that effect. Any organization tips are helpful and anything else is nobodies business but yours. So, keep on keeping on and ignore those folks that think otherwise. Thanks for the article and have a great day. Um, excessive is finding 4 open jars of peanut butter. Everything in triplicate should only apply to insurance forms. Forget the haters and judgers. I am so jealous. I’ve always wanted a pantry. 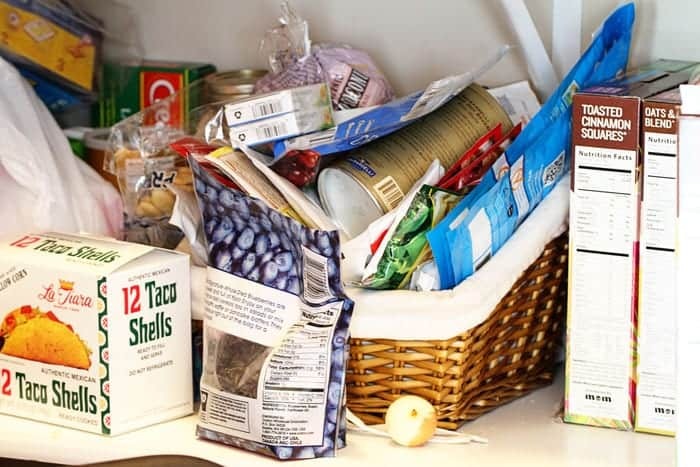 I use dollar tree plastic bins to organize my daughter in laws pantry. It turned out so great. I got all the same color to look cohesive and we loved the result. Each bin was a dollar. I have those clear acrylic acrylic containers. Love them. Don’t by the kind with the flip lid. They aren’t air tight. TJMaxx has the acrylic containers for a great price. 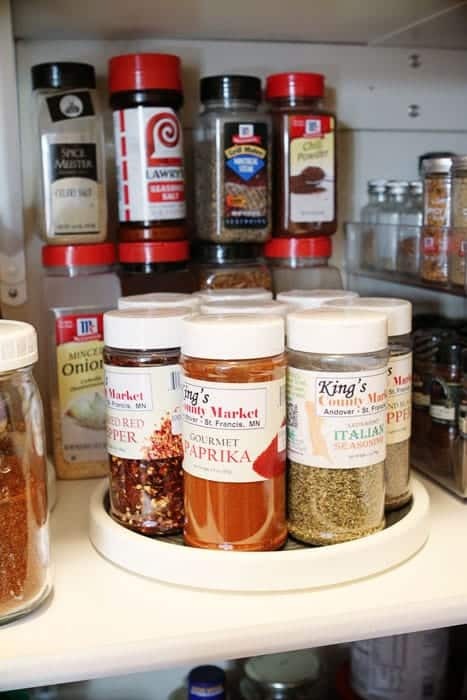 Another helpful pantry suggestion: use an over the door shoe organizer to hang small packages, boxes or quick snacks. Awesome job on pantry. 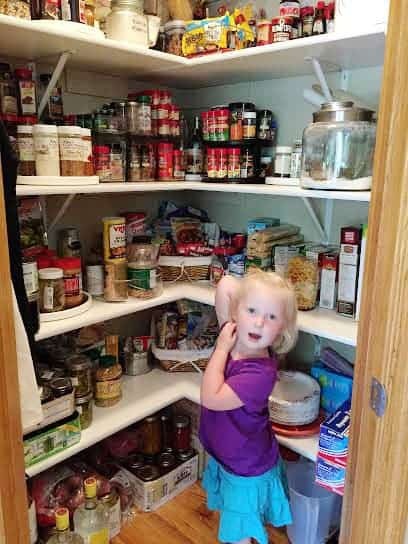 I too have had comments about my food storage spaces. Thankfully, these comments fall on deaf ears. As I hope they do for you. I purchased a 5ft.stainless steel 3 tier shelving unit for my food storage. 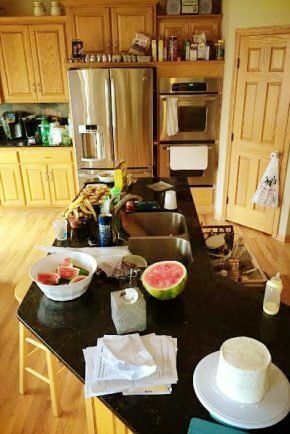 Amanda your a brave woman to expose your kitchen. I have a very tiny kitchen and would never do that. However you have given me lots of space saving advice. Thank you. I love all your recipes. Please don’t compare yourself to the Kardashian’s lifestyle. I highly doubt she shops at garage sales. I doubt she even cooks every meal and probably has a nanny or a personal assistant. 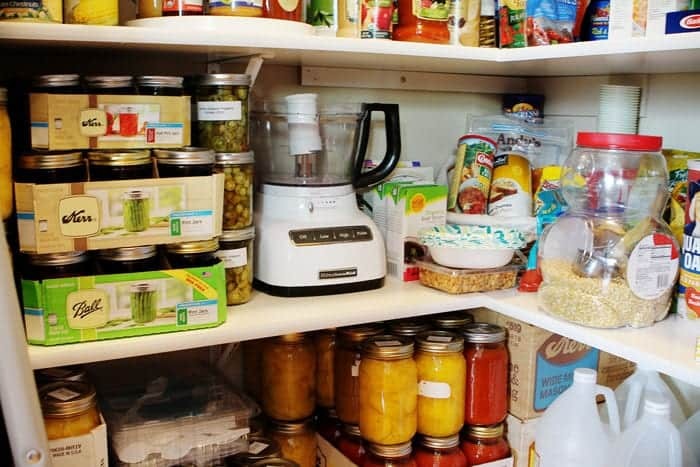 Your pantry transformation is wonderful. I’m sure most of us start out with good intentions but life gets busy. It reminds me I need to clean mine out again. 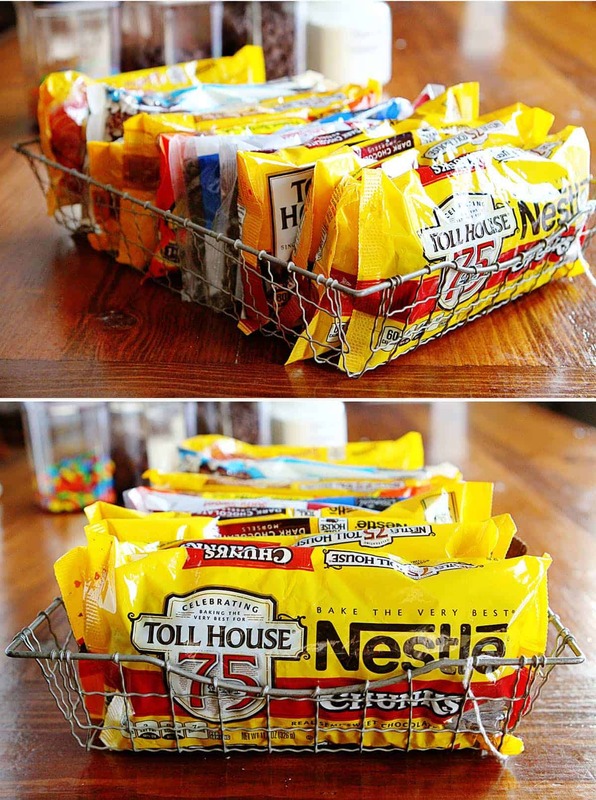 I love the organizing tips! Really liked hearing from a real mom that cooks!